University Meets Microfinance (UMM) is a European initiative, which fosters cooperation between European universities, students and microfinance practitioners to contribute to microfinance innovation and education for sustainable development. UMM was launched by PlaNet Finance and Freie Universität Berlin in 2009 with the support of the European Union, the PlaNet Finance Foundation and other partners to meet students and academics' growing interest in microfinance education and research. UMM is active in the domains of microfinance education, microfinance research, information capitalization, professional exchange & dissemination of information. Today, the project is financially supported by the European Union under the framework of its Development Education and Awareness Raising (DEAR) program. In addition to the support of the EU and the original initiators, UMM is also supported by the European Microfinance Platform (e-MFP), the Deutsche Gesellschaft für Internationale Zusammenarbeit (GIZ) GmbH, on behalf of the German Federal Ministry for Economic Cooperation and Development (BMZ), the Agence Française de Développement (AFD), the European Investment Bank Institute (EIB-I), the Frankfurt School of Finance & Management and Capgemini Italia (country partner Italy). As of today, 59 academics from 41 universities and 65 microfinance practitioners from 36 organizations volunteer to support UMM as Selection Committee members. In total the UMM events gathered more than 4,600 students, professors and practitioners from more than 10 European countries. 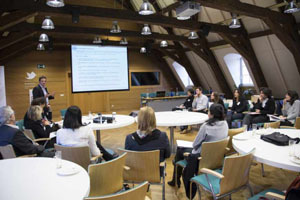 In 2010, the European Microfinance Platform set up the e-MFP University Meets Microfinance Action Group as a result of the interest of several e-MFP members to further enhance students' research and microfinance education and to develop linkages between students, researchers, academics and practitioners in order to produce quality research outputs. The main objective of the Action Group is to perform as an innovative task force active at the different levels of education, knowledge creation, capitalization and dissemination in the fields of microfinance and inclusive finance.